Many people imagine that Helen Keller's famous teacher must have been a saintly person who was always sweet, mild, and kind. In actual fact Annie Sullivan was a strong willed person whose social graces were awkward and who had a fiery temper. In fact, when she was a child she was considered to be a ""spitfire."" Annie had a very good reason for being this way. Her childhood was horrific with her father beating her on a regular basis when he got drunk. Finally, after his wife died, Annie's father abandoned eight year old Annie and her siblings. The two eldest children were taken to the poor house where Annie's frail little brother died soon after arriving. Annie lived in the poor house until she was fourteen. Luckily someone heard her pleas that she be allowed to go to school and Annie, who was practically blind, was sent to the Perkins School for the Blind in Boston. At first Annie had a very hard time at Perkins. She had never learned to read or write, her manners were rough, and she took offense easily. But, over time and through hard work, Annie caught up with the girls of her own age, and when she graduated from the school Annie was at the top of her class. Thinking that Annie would do well in the position, the director of the Perkins school suggested that Annie should take a teaching job in the household of the Keller. And so Annie traveled to Alabama to take on the challenge of finding a way to communicate with a deaf-blind child who was willful and out of control. So many people have, with good reason, great admiration for Helen Keller and for her extraordinary achievements. 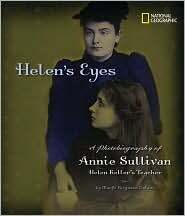 What they often forget is that Helen would never have been able to learn the things she did if it had not been for the persistence, kindness, and skill of her teacher, Annie Sullivan. This excellent book gives Annie the praise she is due. It also shows readers that Annie had a very hard young life and suffered a great deal because of problems with her eyes. She did not let either of these things prevent her from doing her best for Helen. For fifty years she stayed with and helped Helen, even when her own achievements were eclipsed by those made by her student. Written with great sensitivity and attention to detail, this book is inspiring and thought-provoking. Quotes and beautiful period photographs are found throughout the book and readers will find themselves acquiring a great deal of respect for Annie Sullivan and her work.